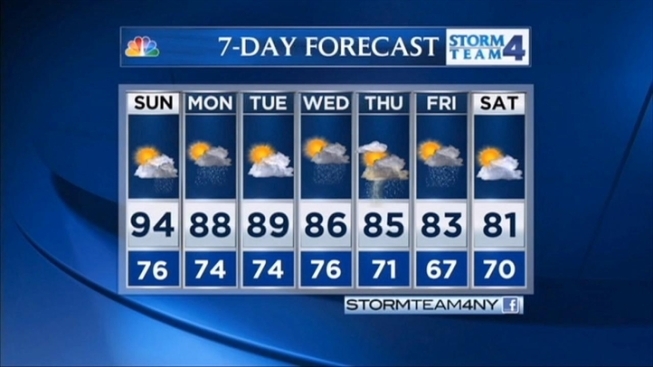 The National Weather Service issued an excessive heat warning for the New York metropolitan area as dangerous levels of heat and humidity were on tap for Sunday. The advisory, which is issued when the combination of heat and humidity is expected to make it feel like it's 105 degrees or greater, was in effect from noon to 8 p.m. for the city's five boroughs, Long Island, Rockland and Westchester counties and parts of New Jersey. Con Edison reported that the utility had set an all-time peak usage record for a Sunday a little after 6 p.m., when 11,283 megawatts of power had been used. The previous all-time peak was recorded in August 2005, when 10,866 megawatts of power were used. Nassau County extended the closing times at all county outdoor swimming pools until 8 p.m to help residents cope with the heat. Sunday is the third straight day of temperatures in the 90s, making the area's heat wave official. Slight relief is expected for Monday with temperatures in the high 80s and a chance of showers and thunderstorms in the evening. On Wednesday and Thursday a cool front sweeps in across the area bringing a good chance of showers and storms that should break the heat and usher in less humid air for next weekend. TODAY: Hazy hot and humid. TONIGHT: Partly cloudy and muggy. A few storms possible. TOMORROW: Not as hot but still muggy. A few storms around. TUESDAY: Hazy, hot and humid. Partly sunny. WEDNESDAY: Increasing clouds with showers and storms. THURSDAY: Mainly cloudy with showers and storms. FRIDAY: Partly sunny. Showers south and east of town. Cooler.